You don't need to plug in your mixer for this recipe. A whisk and a sturdy rubber spatula will be the best tools. Start by combining almond meal and sugar in a bowl. Next, lightly whip egg whites until they build up to a soft fluffy mound; you are not aiming for stiff peaks. Fold the egg whites into the almond meal mixture. It's fine for the whites to deflate; it will just moisten the almond meal and make it start to come together. Next, add some smooth apricot jam (if you use apricot preserve like I did, you can warm it up and then strain it) and a few drops of almond extract. I know we're not supposed to go overboard with almond extract but I love it so much that I find myself reaching for the bottle to add a couple more drops. Stir the mixture together. A stiff rubber spatula is great for the job. Sure enough, a sticky dough forms. If necessary, you can use your hands to bring it together. Now we really get our hands in there. Grab enough dough to make a 1 1/4 inch round, then shape it into a rough oval, setting the shaped cookie dough onto a plate as you go. Finally, roll the cookies into some lightly beaten egg whites and then give them a turn in sliced almonds (or pignoli nuts), pressing the nuts generously and firmly onto each cookie before setting onto a lined baking sheet. I got 13 cookies out of my small batch, with a little baby cookie bonus I considered a baker's treat right out of the oven. Bake these in a low 325 oven for about 20-25 minutes, or until the cookies and/or nuts are golden brown. If you make plain cookies, still roll them in egg white, allowing the excess to drip off (so the liquid doesn't pool at the bottom of the cookies). The egg whites give them a nice golden hue and sheen. They really do look like little gnocchi, right? These cookies smell so wonderful. They have a nice crust but they yield and are tender - and so chewy - in the center. If you are a fan of almond cookies, put your almond meal to good use and make yourself a batch of these. They are a real welcome treat for us almond lovers! * If using apricot preserves or you need to smooth out the jam, you can heat it until warm, then strain it through a fine mesh sieve. You can also omit the apricot jam and add an additional 1/4 cup (50g) sugar. In a large bowl, mix the almond meal and sugar together. In a separate bowl, whisk the 3 egg whites with a pinch of salt until they start to mound and look like softly whipped cream (they should not be stiff). Fold the egg whites into the almond mixture (they will lose volume, which is okay). Fold in the apricot jam and few drops of almond extract (I'd say up to about 1/4 teaspoon). Mix the dough until it comes together in a smooth ball, using your hands to knead the dough if necessary. Pinch pieces of dough about 1 1/4-inch in diameter and rolling each into a ball. Then shape each into an oval using your hands (you can leave them as rounds if you prefer). Set the dough ovals on to a plate as you work. In a small bowl, lightly stir the egg white with a fork for about 10 seconds to loosen it. 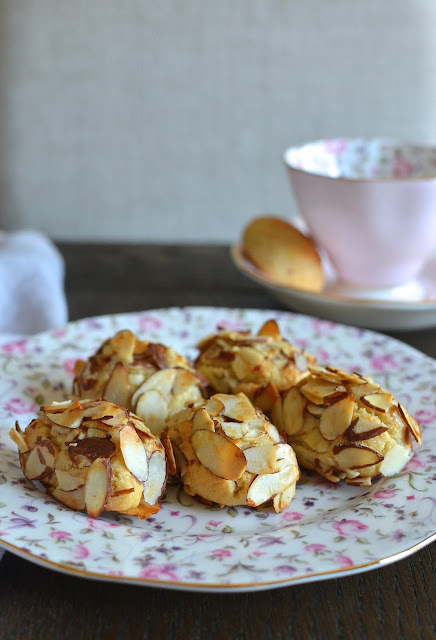 Place almond slices on a plate. 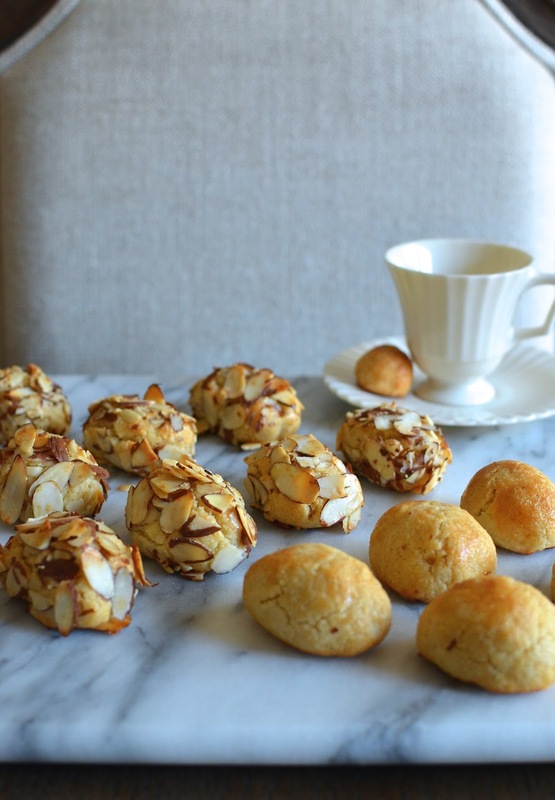 Roll each cookie dough in the egg white, then roll it in the almonds. Generously coat each with almonds, gently pressing them to make them stick to the cookies. As you work, set each onto the prepared baking sheets, evenly spaced apart. Bake cookies, rotating the pans midway through baking, until cookies and nuts are lightly golden brown, about 25-30 minutes (though I found mine were done closer to 20-25 minutes). Let cookies cool before serving. Once fully cooled, cookies can be stored in an airtight container for up to a week. Alternative: You could omit coating the cookies with nuts. Just roll the shaped dough with egg white, letting the excess drip off before setting on the baking sheets and baking. These little cookies look divine! The plain one already looks very good, but those with almond slices are will make a lovely gift. I agree; the plain ones turned out better than I expected but that extra topping of crunch on top is really nice. These cookies are SO cute, Monica! I love both versions you made, hope your son's teeth is healing up okay. Yay for no mixer required too! :) I wish I had a few with my tea right now! I am making these cookies right away, I can tell that these are special, thanks Monica! woohoo!! That's music to my ears. You make me want to roast beets and I gave you cookies...not sure it's a fair swap but thank you! Monica these cookies look so delicate and also look like gnocchi! Really elegant looking. I think these would make a gorgeous holiday gift! These look so beautiful and delicious! And I definitely agree with your sentiment about David Lebovitz... You always know his recipes will work! He is always fabulous and my family has eaten better in part thanks to his recipes! You always speak my love language when you post almond baked goodies! I can never get enough. Andd I totally think of you whenever I bust out the almond extract, etc.! I know you share my love for it all! haha - yes! We share at least the love of sweet potatoes and almond extract! hehee...love that! I am so excited to see this recipe on your blog. I tried Sicilian cookies in Italy and they were so good. I have to make these asap. Oh yay! I wonder how these compare. I just adore these cookies and thank the brilliant Italian chefs and bakers for all these almond pastries. If you love chewy almond paste, you'll adore these. Thanks, Medha. Yes, I do remember your love for all things almond:-) These look and sound absolutely fantastic. I love the addition of apricot jam...so delicious Monica. I'm so making them for Christmas. Yes, totally love them all! Can't wait for Christmas. I am very behind on shopping so I have to get at it...but first, the Election!! Glad you like them, thank you. Absolutely made with you in mind, Tricia. I went from having zero appetite this morning to thinking I could eat a box of these right now. What a day. Never too early to think Christmas cookies. I totally want to think about that right now.